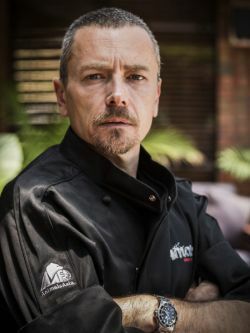 Simon Bryant's cooking career began more than 25 years ago in Thai and Indian fast service restaurants, including a stint as a butcher, function caterer, and a post with Hilton Adelaide which saw him initially as part of Cheong Liew's team in The Grange Restaurant, and then in the role of the hotel's Executive Chef for seven years. Simon is known to millions of Australians as the chef from ABC Television's The Cook and the Chef, in which he teamed up with the Barossa Valley's Maggie Beer for 150 shows over four years. Simon has been working on Tasting Australia - Australia's preeminent food and wine festival since 2014 and was appointed as Co-Creative Director in 2014 and 2016, and most recently as the sole Creative Director in May 2017. He is the author of two cookbooks; and providore of South Australian company dirt(y) inc which offers single origin, traceable, non GM, Australian grown wholefoods. Simon is a passionate advocate of using menus to throw light on the minefield of ethical issues surrounding food, whether it be fair prices for producers; delivering more thoughtfully produced food; using best practice ingredients with minimal environmental impact; the responsible and culturally appropriate use of Australian native foods; or the ethical treatment of animals in the food chain. Above all Simon is, "… a hands-on cook of simple, pared-down, produce-driven, honest cooking that tastes better than just a bunch of words on a menu! It's about the product and the producer these days for me," he said. "I'm not a native South Australian but I chose to be here because I truly believe that this state has the best food and wine in Australia."